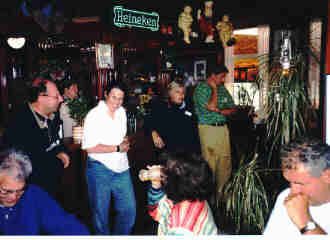 Once again, the Limburg 1999 meeting. Lots of Spiders, 5.12 seconds, Spiderman's cousin and royalties. Finally we were ready. My name is Wille R. and I had just returned from Northern Ireland after three weeks of hard work there. Stina had prepared everything as usual; I just had to change the oil and filter, same procedure as always. The Spider was cleaned, waxed and polished, thank you Stina. This time, we took the TT-Line ferry from Trelleborg to Travemünde late on Wednesday evening, slept well in our cabin and hit the road at 07.30 next morning. Excellent weather for a Round tail and we cruised on national roads and on lots of minor local roads through a sunny Germany. No problems and we spent our first night in Gelderen. 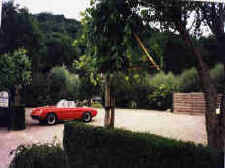 We found a nice Italian (of course) hotel and it is amazing, how well you sleep after ten hours in an open Alfa Romeo. Later, we learned that we were only one hour's drive from Spiderman's residence. We know where it is now for next year, so take care. Where? In the Limburg area, you will find it on the map between Maastricht and the point where the borders of Holland, Belgium and Germany meet. Who? The Dutch Spider Register organises and the Veloce-sites assist in promoting. Members? 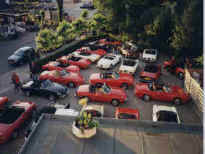 Just Alfa Romeo Spiders from everywhere are invited. Occasionally we have Giulias or other Alfa Romeo cars for transport etc. What do you do? Have a good time, eat, drink, drive, chat, relax, laugh, make new Alfafriends. Tell lies about our Spiders and get some culture too. But the Spiders? 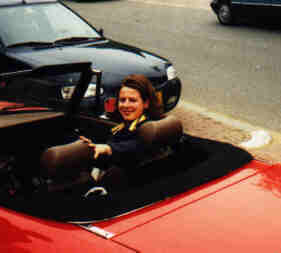 Yeah, we just love our Alfa Romeo Spiders and we are proud to be in friendly Holland. There are Spiders from all over Europe. Check the reports. How many? The event takes place over the weekend. In total around 85 Spiders. Some are there for three or even four days, some for two days and some come just on Saturday or Sunday. They are all welcome. Must cost a fortune, lots of fun and Alfa Romeo? Nope, we have been there some years and know the area, so it does not. Last year, we found that the weather in Holland might be unpredictable, so we had done some practice with the hood. In the Formula one and the BTCC they make pit stops around 4 to 6 seconds. Once, we got the hood snapped in just 5,12 seconds so we were really well prepared. So, this time, the other Spiders would be facing a hard time with the hood. Actually, the Dutch Spider Club had prepared themselves with nice umbrellas, big enough to cover the seats, driver and co-driver all together. We got one too and it turned out to be most useful! We were the first to arrive at the Hotel Slenakervallei after cool driving on the local roads in the Limburg area. Many places were familiar since we had been there last year. Lots of "that's were we lost the white Giulia" and "remember the blue smoke Kamm-tail" made the trip even shorter. We parked the Round-tail and had a beer, waiting for the others to arrive. This year I knew that there were three hotels reserved for us. The Spider felt kinda lonely in the parking lot. That feeling didn't last for long. Miles away, we could hear the light alloy twin-cam engines revving and the gulping Webers, so, just like that, they all arrived and the parking area became more and more crowded. Cobi, Erwin, Hans and Spiderman came shortly after us and then the other members. Honestly, could there be too many Alfa Romeo Spiders? "Wow, good to see you again, hey, come and have a look at my Spider, remember last year when hm, hm, did this or that". It was good to see Carl Timmer and his black Giula Spider. When Stina and I first met Carl last year, we thought that it was HRH of Sweden, Prince Bertil, a racing enthusiast and Bugatti driver in the -30s. They look so similar, that Stina turned mute for two minutes. And that's a record. We like the Spider meetings! We missed the Giulia Sprint from Italy, but I know that Andrea Pieraccini has laid his hand on a Duetto last May, so he will be there next year again. That Friday went very fast and before we knew it, we had a nice dinner and had a special Alfa drink at the bar too. 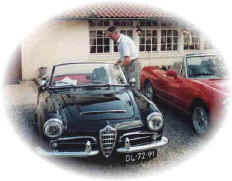 Klaus and Hilde Mohr had brought the entire family in two Alfas. A black 1750 Round-tail Veloce and a 1300 Jr Zagato plus a teenage son and daughter. I liked that, because the two immaculate Swiss Duettos, who were there in -98, couldn't make it this year, so our Duettos looked very nice this time compared to some of the others. With last year's fake tandem bicycle ride in mind (Stina and I had to do eleven times the distance the Dutch did), we were all wondering about this year. Sun was shining and the black Spiders looked very cool and clean. Not a single scratch or piece of dust on them. That was in the morning. Kodak made a fortune because everybody grabbed the opportunity to take some photos before breakfast. Christiaan Spaan, Klaus Mohr and Tony Borgioni's black Spiders got the final cleaning and then we drove away. 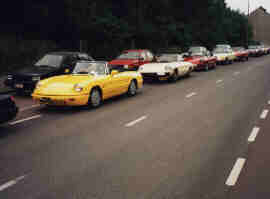 The long line of Alfa Romeo Spiders sure was an impressive view. There were red, black, white, silver, green, brown, blue and even a yellow 4th series Spider. Nice colour on a Spider, BTW. We were in the middle of the line just behind an oil-burning Kamm-tail. Did Alfa manufacture diesel engines too? Stina said she was getting a head-ache and me too, so I faked some engine trouble and let a few Spiders pass, so that they could share the smell of the blue smoke too. I am always generous and find it very polite to let other people enjoy my experiences. Unfortunately, I jumped into the wrong barrel. I found myself driving behind Jan Groen, who had borrowed a Kamm-tail that was an even worse oil-burner, than the previous one. I think that Spider belonged to Jan Spaan. Cobi had totalled her Spider two weeks ago in Scotland, so she was driving the reaming Spider in the Groen family. I wonder for how long, the way she drives, a real "Mini-Fangio". The problem driving behind Jan Groen was easily solved. Those of you, who know Jan Groen, know very well that he likes to overtake and leave every car behind him. So he did thanx. A nice break for coffee, chatting and relaxing and watching the other Spiders drive by, was most amusing. At the restaurant, we were all wondering how they could miss the impressive line of Alfa Romeo Spiders lining up in the parking lot. We finally ended up for lunch, had yet another excellent meal. 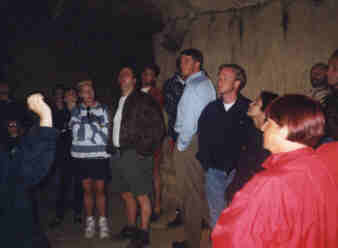 After some more Alfa related chat we had to go down in an enormous cave and mine named St. Pieter. It was previously used as a source for sandstone and turned out to have an interesting history. Since the temperature in the sun was really high, we all rushed down to the cave. In the quite chilly pits of the mine, we got deeper and deeper. There was no light at all in the mine, like when British cars were equipped by the Lucas "King of darkness" Company. 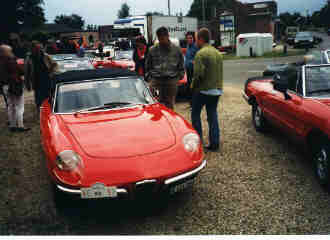 The photo shows interested Alfisti with eyes as big as teacups, listening to the guide. We walked and walked and some found it very cold, but I come from the land of Vikings and the Arctic, so I didn't mind. I was expecting it to become warmer and warmer down there. I was also looking for Spiderman's cousin there, I had this picture of his family with horns on the head, tail and a big shovel plus an enormous fire and lots of coal, but we never met. Instead, we got lots of culture and interesting stories down there. Some of us stamped our feet to wake up the Australians. It was good to enjoy the lunch after the mine. The organisation had another thrilling surprise this year. We swapped our co-drivers and got a map that looked like "how to make you own bomb from the Russian revolution". The Dutch were of course very familiar with the Ball / arrow system rally. Every Spider got a new crew and everybody was very exited. I scored ten when Joyce Lemmens landed up in my Spider. With such a co-driver, I might very well have taken the long road or even the longest, but we followed the instructions and after some disputes about the map and balls and arrows, we ended up with some other Spiders. It was quite a mess until we found that the left and right arrows on the map indicated just 100 meters between each turn. Very funny! The distances before were 2.500 meters etc. so you really fooled us again! During this excursion, we had to pass a spot with some mud and water. The mud was very tan and almost yellow, easy to spot on a black Spider. Anyway, we were supposed to find some letters here and there and add the letters together. Joyce and I were thinking and thinking, but the letters just did not make sense. Well, again I was fouled; the word was something in Dutch I didn't know anything about. That's probably why we didn't win or what do you think, Joyce? At the finish, Klaus Mohr was waiting and waiting, but his Hilde and the black Spider never showed up. Stina asked him if he was worried about the Spider or his wife? The arrived some 60 minutes after us, in good condition but with a somewhat muddy car. Hilde and the co-driver Marianne Badoux had some communication problems, since they didn't use the same language. The beer tasted most refreshing in the sun. Back to the hotel, actually, not everyone drove back. The two Jan, Spaan and Groen stayed to solve a malfunction trouble with the front brakes of a 4th series Spider. That kept them busy and I didn't have to keep off the road for Jan Groen and his oil-burner. That evening, the organisation had made it again. 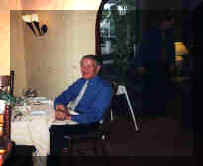 We had a four-course dinner with perfect wine and everything. The conversation was "forte crescendo" with many good laughs. Some of us got prices and I got a big bottle of Genever. Three black Spider owners were asked to step forward too. Christiaan Spaan, Tony Borgioni and Klaus Mohr got awards for yelling about the mud. Christiaan is most keen on keeping his black Spider very tidy, so he got a bucket of dishwater and some soap. That kept him occupied for a while and the rest of us had a good laugh. Time just flew away in the Alfa chat bar. Little Dagmar had grown another year and I never saw if she got new dipers on the bonnet like last year. When she has become a teenager, she will most likely prefer not to be reminded of that or? Young girls have a tendency to be tricky about things in the past. We had yet another great collective breakfast Sunday morning and then we drove our beauties in a long convoy. At the first stop that day a Swiss Duetto from Neuchatel, owned by Maarten DeGroot was waiting for us in the parking lot. Oh, no, not again. It was so clean and red and tidy, even underneath. How do they do it? I wonder what it will be like next year, when there will be more Duettos from Switzerland. If I bring my Duetto on a trailer and spend two years cleaning it, mine will look like that. The sun was evidently afraid of our roaming engines, because the sun started to hide herself and the clouds showed more and more interest. Finally they started to applaud and that was no problem. It was the heavy rain that was the problem. After the lunch-break the sky was wide open like the throttle of a 40DCOE, the rain poured down and every hood went up in less than 5 seconds. Some Spiders were of the right kind, as long as the Alfa was moving fast, the rain only hit the windshield. But as soon as you reduced speed, they were facing problems and I mean great problems and water. My personal opinion is, that they knew that there was a photographer and a video camera waiting and the wanted to look their best, despite the rain. The rain was not so funny, so within short, every spider had the top closed. If you have seen "The Graduate" you may remember the scene where Dustin Hoffman tells Ann Bancroft that they are through and the rain floods down. This was on everybody's mind, although nobody broke up any relationships. The asparagus and traditional spare-ribs at the Arizona tasted good after this well-organised Spider meeting in Limburg -99. What strikes me, is the good and friendly atmosphere, no matter if we are driving, eating, drinking or taking care of our Spiders. This is something to reflect on in the cold winter. We found that Stina and I got company at the hotel, because there were three Spiders going to France the next day. Some beers and many laughs made the planning and reading the maps that evening enjoyable. Bas and Janneke Warnar, Cees and Marianne Badoux, Stina and I and Mieke tried to make out the best route to France. Spiderman looked like a Napoleon general with all the maps in front of him. Strategic planning or? Stina and I left early next morning for France and the Alsace valley. We met the red Warnar Spider up in the hills close to Colmar the next week. What do you think we were talking about? 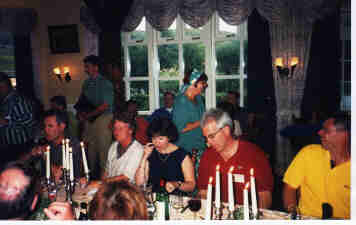 It is time to make reservations for the Millennium Limburg meeting next year. Stina and I have already checked the ferry timetable, so we will be there! Thanx a bunch to Cobi, Hans, Roni, Erwin van de Wal and their families and all the rest who made this such a memorable visit. See you all next year. And Spiderman, don't be afraid of the Taxman!